Na Nach Nachma Nachman Meuman: From the perspective of a person's ego, an open letter. From the perspective of a person's ego, an open letter. Nanach isnt just a political party. Its the party that celebrates Hashem that everyone should be celebrating all the time. Being moshiach is too big of an avoda for me. "A little is also good." (Rebbe Nakhman taught.) So, its better to be a nanach than to be Moshiach. It is better to be one of the people that will save the world, than to take on all of the responsibility, yourself. If we can all just clean our own little section of the world, our daled amos, that would be amazing. If all people would take care of their own reshut hayakhid, then all of the reshut harabim will have been fixed, yielding a collective yeshuah. Redemption earned is much better than a Redemption from the side of Judgement. I'Y'H there is still time left. 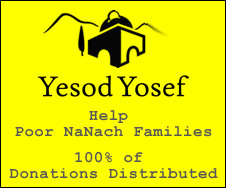 If Moshiach Ben Yosef does not have to take on all of the responsibility himself, perhaps he will survive ! 1 Seat in Kenesset is enough. "1 Drop of the King's medicine, which is made out of his crown, is all that needs to get digested to save his son, the prince." 1 Pitcher of oil, was enough to keep the Menorah lit for 8 days! 1 Petek conquers the world. Every single (1) nanakh, is a candle in the olam hasheker, the olam ha-M'F-orsamei sheker. B'H for Na Nakh Nakhma Nakhman Meuman. Awesome! So much chizuk, thank you for this. weren't for Na Nach isn't that 100% obvious?